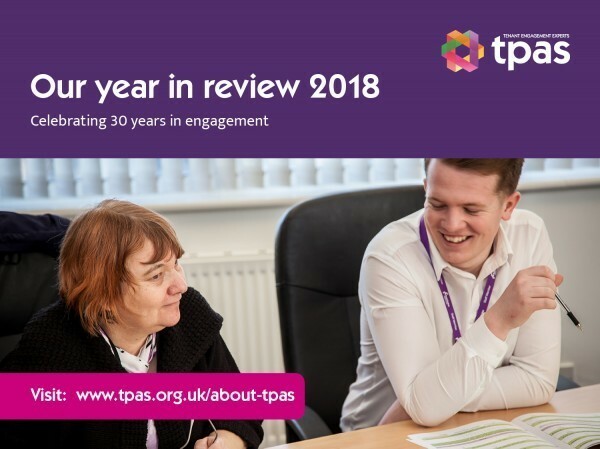 We’re about to enter membership renewal time for 2019 so now is a good time to review how Tpas, with your help have had a year of growth, influence, delivery and learning. Our membership network are vital to our success at championing engagement. We’ve had a busy year of campaigning, best practice reports, policy activities, round table, ebooks, conferecnces, webinars and much more. We’ve seen huge rewards from the sharp rise in new members joining Tpas. Together we’re stronger, which has enabled us to introduce new innovative ways of connecting and servicing our members including an expanded events programme and a webinar series. Our relationship with the MHCLG, the Regulator of Social Housing and other strategic partners is strengthening at pace. This year on behalf of our members we’ve been invited to sit on major sector committees and policy forums. We’re at the forefront of shaping and influencing housing policy and have a seat at the table to voice your needs and aspirations for successful engagement. 2018 was a year we took some risks with offering the sector new products and services including our new fire safety course. This course was uniquely designed and aimed at both tenants and housing professionals to discuss how best to keep communities safe in complex buildings such as sheltered accommodation and high rises. A large proportion of our resources this past year were set aside for research. We’ve worked with a number of stakeholders to explore fundamental questions about the future of social housing to stimulate positive change for the future. So, what’s ahead for 2019? We’ll continue to be part of the positive momentum for meaningful engagement to be delivered in all organisations. We want 2019 to be the year we see engagement fully embraced and embedded again within the whole sector, from the board to the front line. With your help and commitment to Tpas we will work to ensure that tenants and communities are listened to, responded to and are a valued partner in delivering better housing services.